White Nose Syndrome (WNS) of bats is unfolding as an environmental and conservation crisis in North America. Some of our most abundant wild animal species and ecological allies now seem headed for extinction, or close to it. This is no one’s fault but everyone’s problem. 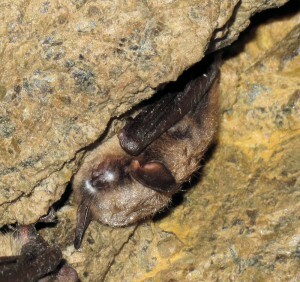 Already in December 2012, WNS was being seen in hibernating and day-flying bats in Atlantic Canada. This week, it was found in two new locations in Kentucky, including Mammoth Cave National Park. Anyone who wants to follow this crisis day by day can do so at the main WNS website: http://whitenosesyndrome.org/. In Canada, oversight of bats and most other wild animals is a responsibility primarily of the provinces and territories, but with some involvement of federal ministries and agencies as well. There is a small number of university scientists who carry out research on bats and others who specialize in fungi such as the fungus that causes WNS. Diseases in wildlife are monitored and investigated by the CCWHC, which is a partnership among Canada’s veterinary colleges and multiple government agencies and NGOs. All of these groups and individuals are essential to an effective response to WNS, but, in Canada, there is no single authority to take charge of a Canada-wide program. Nonetheless, Canada has developed a coordinated national program to respond to WNS and to link that response to similar actions being taken in the United States. The Inter-agency WNS Committee was established in 2011 to maintain communication among all parties in Canada engaged with bats and WNS, and to plan a collaborative national program aimed at reducing the negative impact of WNS as much as possible. This Committee developed, first, a national management plan (January 2012), and then a set of detailed action plans for on-the-ground activities to achieve the goals of that management plan (October 2012). This national response to WNS is coordinated by the CCWHC and operates under the authority and endorsement the Canadian Wildlife Directors Committee, a council of federal, provincial and territorial wildlife authorities. The response includes tracking the spread of WNS and the fungus that causes it, monitoring bat populations, and doing everything we can currently do to protect bats and slow the spread of the disease. It is an ambitious program and one supported by very limited resources. We hope to create opportunities for everyone to pitch in. When such opportunities come your way, please sign up! I want to report finding a dead bat on my property today. Recently dead, he had white substance on his nose. I live in the SW monteregie area of Quebec (Huntingdon Qc). I have always had bats on our farm and we cherish them and want them to thrive here. I have kept the corpse if you want it. Please feel free to contact me at this email address if you need further information.